Experience the natural wonders of Papallacta and the Antisana Volcano! The village of Papallacta has a cool climate offering natural thermal springs. It is believed that these thermal waters have the power to alleviate illnesses such as arthritis, digestive problems or bad circulation. Papallacta springs are a restorative experience. Located in the heart of the Andean paramo, between the Cayambe and Antisana volcanoes, we will find the astounding Papallacta hot springs. Their privileged location between these two colossal volcanoes gives this hot springs very special and unique characteristics. Water coming out of the spring can reach a temperature that ranges from 30° to 70° C (86° to 158° F), and they are filled with minerals that give them medicinal properties. You can relax and enjoy this wonderful spa and enjoy the special treatments offered here, or just relax in the natural pools. Accompany us on a relaxing and wonderful tour to one of Ecuador's best spas, and let your worries melt into the medicinal waters of Papallacta. Enjoy the magnificent cuisine at the spa, and if you'd like, you can take a short hike into the Andean paramo, enjoying the incredible sights of this natural landscape. A representative of our team will pick you up from your hotel and drive you to the spa located only 40 miles east of Quito. On the way, you will learn more about the Andean paramo, its ecological importance, and the incredible wildlife that has made this area their home. Upon arrival at the spa, you can choose between simply relaxing in the pools or taking a short hike around the spa. 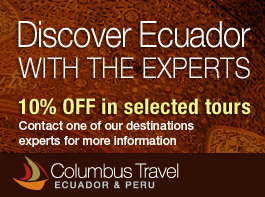 After lunch you can relax a little bit more before returning to your hotel in Quito. Note: Special spa treatments are not included in this tour. The magnificent Antisana Volcano, located just a few kilometers from Quito, and its surrounding natural reserve is one of the most charming and breathtaking places of Ecuador. The Mica Lake, located within the reserve, is an idyllic place for bird lovers, as many species of Andean birds dwell along the shores of the lake; occasionally, Andean condors can even be seen gliding through the clear skies. We will visit this natural reserve and then relax in one of the best spas of Ecuador: “Termas de Papallacta” This unique spa has natural thermal waters with extraordinary medicinal characteristics. Day 1. 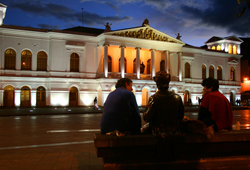 (L, D) On the first day of our tour, we will visit the Antisana reserve. In the morning your guide will pick you up from your hotel and together you will drive to the reserve, passing through spectacular landscapes dominated by mountains and lava flows. You will then reach Mica Lake, where a short hike will take us around the lake, and we may climb to a small lookout point from which you'll be able to see the majestic Antisana and the lake on the other side. 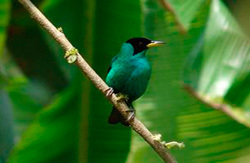 The Antisana reserve is one of the few remaining pristine Andean forests and is home of many species of flora and fauna, like rabbits, deer, condors, hummingbirds, and even the elusive spectacled bear – your guide will explain to you much more about this complex ecosystem and its importance to preserve water. After visiting the reserve, we will have lunch at a local hacienda, and we will try the local flavor of the Andes. Later on, we will drive to the thermal waters of Papallacta. 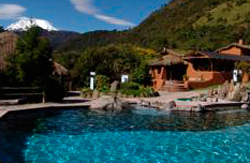 In Papallacta, we will enjoy the thermal pools and spend the night in this idyllic location. Day 2. 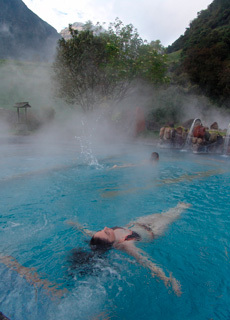 (B, L) Termas de Papallacta is one of the best spas in Ecuador. The warm waters have very unique characteristics that give them medicinal properties. Swimming in these natural pools will certainly relieve you from muscular and joint pains and leave you relaxed and feeling rejuvenated. Besides enjoying the healing properties of the hot springs, you will also enjoy the magnificent view of the surrounding mountains and the characteristic paramo that surrounds them. If you'd like, you can take a short hike accompanied by your guide and enjoy the beauty of this place. After lunch, we will return to the city of Quito.